FairLifts schedules advanced geomatic, photo, film and data acquisition using cutting-edge imaging technologies including airborne LiDar, Photogrammetry, GIS compilation and more. We arrange access to superior aircraft, hardware and a suite of geospatial data systems to provide precise and cost-effective image and data collection for companies in California, including community developers, energy resource providers, utility companies, and civil and federal agencies. Helicopter aerial surveys and mapping enable a constant overhead view that is superior to ground-based methodologies. Helicopters provide superior service in comparison to fixed-wing aircraft given their ability to reach remote and inaccessible locations. The global network of helicopter operators we work with provide pioneering data collection systems that facilitate aerial land and hydrographic surveying, utility services coordination, transportation infrastructure projects, construction and engineering phase services, and a wide range of industry projects. Last year, California experienced the most devastating wildfire season on record. More than 9,000 fires scorched 1.3 million acres of land in the state, and over of 10,000 buildings were destroyed. The fires also claimed the lives of 47 people. The state has been using aerial surveys to create maps for utility companies to determine ways to prevent the devastation of wildfires by using LiDar remote sensing to collect data to assess potential fire threat areas. By using state-of-the-art LiDar detectors, helicopters can create detailed maps and use forecasting and modeling methodology to predict how wildfires will likely spread. Given that California has often remote and rugged terrains that are inaccessible by ground transportation, helicopters are vital to providing surveying and mapping solutions for aerial land and hydrographic, utility services coordination, transportation infrastructure, construction and engineering projects. 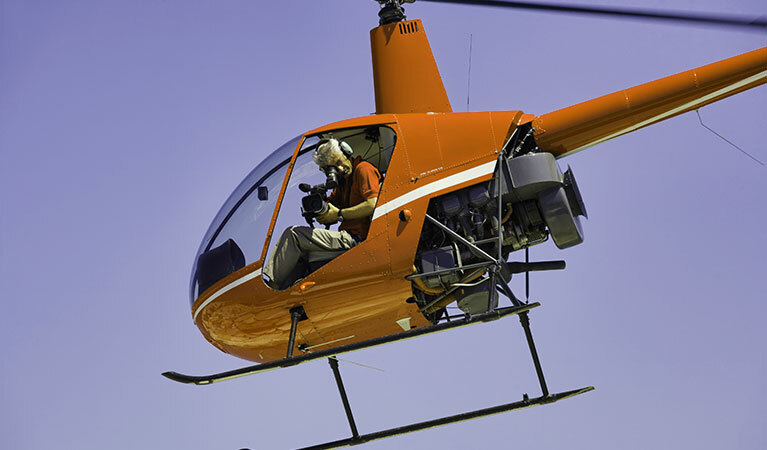 By integrating aerial surveying and mapping technology with helicopter support, the global network of helicopter operators we work with ensures advanced data collection and imaging for companies in California. LiDar (Light Detection And Ranging), a data acquisition technology used in aerial mapping application, enables scanning lasers to measure the distance between objects. The laser covers the surface of an object with points of lights and measures how long it takes for each point of light to return to the scanning device. LiDar, when used with GPS and inertial technologies, generates a three dimensional set of points provides a precise terrain model. GIS, a digital framework that collects geographic data, retrieves and analyzes spatial locations and geographic patterns to created 3D images that provide valuable insight for businesses, private contractors, utility companies and resource providers to identify patterns, relationships, and potential problem areas, allowing providers to detect anomalies in utility installations, map environmental variations, perform area exploration and excavation and establish future actions. Photogrammetry extracts 3D data from images by taking overlapping images and converting them into 2D or 3D models. For mapping, elements combine to provide film and digital aerial photography, digital terrain modeling, digital elevation model (DEM) development, ground control surveys, image scanning, digital aerial triangulation, and airborne GPS, delivering vital data to developers, planners, business owners, etc. In California, to ensure uninterrupted energy transmission, utility companies rely upon aerial solutions to secure existing infrastructure and collect crucial data to develop new power line corridors. Helicopter support enables precise surveys of current installations and preliminary surveys for future infrastructures. Aerial LiDar technology produces accurate, 3D surveys of terrain, vegetation, and electric utility installations. In California, local officials, engineers and developers rely upon aerial imaging to map urban areas in order to improve town planning. Helicopter support enables high resolution digital aerial cameras to be used with airborne LiDar and photogrammetry technology to generate images, minimizing the cost and need for road closures and additional ground crews. Collected images deliver precise depictions of building outlines and roof structures to generate 3D urban models to improve current developments and plan future land development projects. In California, transportation infrastructure projects rely upon helicopter support and image collection technology to execute precise road and route studies, as-built surveys, GPS surveys for project development and construction, hydrographic surveys, design engineering surveys, ROW mapping, and much more. Urban planners and transportation departments use aerial surveys to develop plans that avoid road, railway, and highway construction delays. In California, civil, federal and relief agencies providing emergency response rely upon aerial surveys and mapping to plan recovery strategies, assess damage, plan and coordinate rehabilitation efforts, and provide images of affected properties for evacuated homeowners. Aerial surveys use LiDar, high-resolution digital cameras, and film-based aerial camera systems to gather data sets and portfolios of aerial images to distribute among oceanic, geographic and meteorological organizations, and relief agencies to counter to environmental changes and natural disasters, as well as plan future emergency responses. In California, timely and precise topographic surveying and mapping resources ensure the growth and development of the mining industry. Airborne LiDar and hyperspectral technologies provide precise data sets from mineral exploration, stockpile and pit volumes, acid mine drainage monitoring, audit surveys, as-built surveys, and leak detection inspections. The results are used to identify nuances in mining infrastructure and are compiled into a GIS framework to develop new mining infrastructure to ensure growth and expansion in the state. FairLifts, working with a global network of helicopter operators, provides support for aerial surveying and mapping. Our expert agents are available 24/7 to provide planning, pricing and solutions in the state of California. Contact us directly or via our online form for immediate, cost-effective and successful aerial surveying and mapping results.